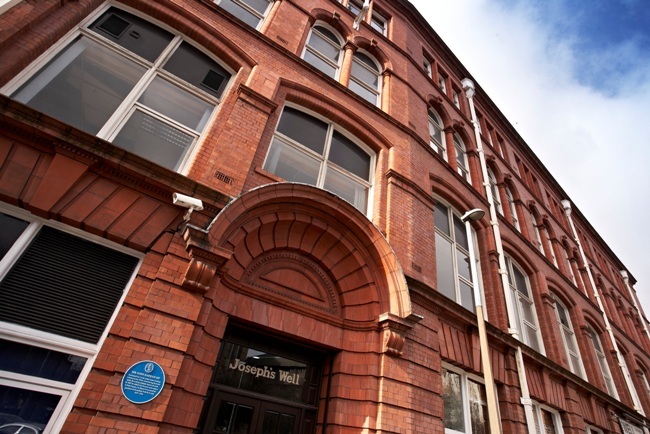 Three new deals have been concluded at Joseph’s Well in central Leeds. St George’s Crypt, digital agency Blue Mantis and recovery and insolvency specialist Lewis BRI have all agreed terms at the historic office building. These deals endorse the spectacular transformation of the 156,000 sq ft five-storey building in Westgate, which was originally built for Leeds clothing magnate and MP Sir John Barran. The regeneration of Joseph’s Well was undertaken by Leeds-based property company J Pullan & Sons, who moved their offices there last year. Francis McAllister of St George’s Crypt said: “We are a charity based in the centre of Leeds – helping and supporting homeless people. Unfortunately the demand for our services is growing. “In order to provide more emergency accommodation, ie beds for people who are homeless, we have moved one of our teams out of the Crypt and into new offices in Joseph’s Well. Martyn Lee of Blue Mantis, who have expanded within Joseph’s Well, said: “We originally chose Joseph’s Well as the location for our growing digital agency due to a number of factors: Lots of natural light in the rooms, great access for our customers with on-site parking, affordable rents compared to other areas of Leeds city centre and a friendly and supportive management team. Bruce Strachan, property director of Pullan’s, said: “These three deals underline our belief that Joseph’s Well provides the best value offices in Leeds. Rents are only £17.50 per sq ft, including all service charges, and are fixed for three years. There is currently 10,000 sq ft of quality office space available in the building in a range of suite sizes from 180 sq ft to 2,500 sq ft.
“These three new deals underline the continuing popularity of Joseph’s Well. Following the refurbishment, we have seen an increasing level of interest in Joseph’s Well resulting in new lettings. Our new tenants reflect the versatility and flexibility of space here, which is attracting a real breadth of occupiers. Joseph’s Well is prominently located within Leeds city centre beside the Inner Ring Road offering easy access to the M1, M62 and M621 motorways and Leeds-Bradford International Airport. It is also within a short walk of Leeds City Railway Station, City Square and all of the main retail and leisure amenities. Sir John Barran pioneered the Leeds ready-made clothing industry in the 1850s, introducing the band knife for cutting multiple layers of cloth. In 1887 he added Joseph’s Well to his other factory in Park Square. As Mayor of Leeds, he secured the purchase of Roundhay Park for the city. Sir John also served as the Liberal MP for Leeds from 1876 – 1885.